I’ve chronicled the Seattle restaurant scene long enough to watch as hugely successful Seattle restaurants clone themselves by heading to Bellevue (see: El Gaucho, Wild Ginger, Monsoon). Well blow me over. Now the tide is turning. 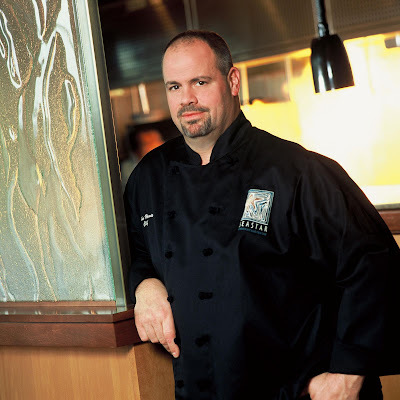 Witness chef John Howie’s Seastar Restaurant and Raw Bar, slated to open in Seattle adjacent the Pan Pacific Hotel. If you’re saying “Ah, hah! That spot!” then welcome to the club. That’s what I said when I heard the news that Seastar will take over where Marazul left off. “We’re tearing it all out, not using any of it — except for the kitchen,” said Howie, of the flash-in-the-Pan-Pacific that failed to make a go of it in the 2200 complex. Marazul closed abruptly in March. Seastar is expected to open in February. “The entire front-of-the house will start from shell,” Howie said, noting that without the surround of windows, as in his Bellevue restaurant, they’ll need to lighten up the restaurant poised atop the Whole Foods Building (as so many of us have come to call that piece of Allentown). “I’ll be completely in charge of menu-development,” Howie said, “and I’ll have some different items going on the menu in Seattle — probably some half- or side-portions of our entrees.” We can expect to find “a bar similar to Seastar’s” (he’s rebuilding the existing bar-space to offer more seating along with a 200-bottle selection). Oh, and then there’s that hotel component. “We’ll be doing all the food service for the Pan-Pacific, the banquet rooms, etc. Their kitchen is probably twice the size of my kitchen here” in Bellevue. And unlike Marazul, he said, in addition to having the right stuff (a seafood-centric concept) he’s got the right staff, including veterans DJ MacIntyre (chef de cuisine), Doug Kawasaki (GM) and the guy who’s long topped my list as Seattle’s most down-to-earth sommelier, Erik Liedholm. The wine program onboard at Seastar will translate in Seattle as “a little more user-friendly,” said Liedholm — a self-described `wine geek’ and mentor to many who plans to split his time between the two Seastars. His motto is “Sell wine, don’t cellar it,” and to that end, he’ll be installing a very visible Enomatic system offering fine wines by the 4-ounce as well as 8-ounce pour. “Anybody can sell the most expensive wine,” Liedholm told me, but he tutors his earnest young staff to “Down-sell, don’t up-sell!” I’ve seen him do just that over the decade I’ve been watching him in action, turning me on to quality wines I may otherwise never have tasted.